Gold Top: the John Lund story is the book that should sit alongside The Sound and The Fury on everyone’s stockcar bookshelf. This is the only book to document the legendary John Lund’s career in detail. 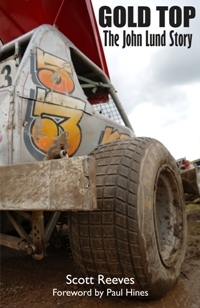 Scott Reeves comprehensively details Lund’s F1 stock car exploits from debut to date covering all the highs and lows of his career including some of the controversies! Written after interviews with the Lund family, it provides a rare insight into the career of one of the greatest F1 stock car drivers to ever grace a racetrack. Edcreations will also be taking orders on behalf of the author. Everyone who is a fan knows the John Lund story, right? Think again – Scott Reeves has written a book remarkable for its attention to detail on one of stock car racing’s all time greats. Gold Top: the John Lund Story is available for only £14.99 including UK Postage & Packing. The book can be pre-ordered through Chequered Flag Publishing HERE. Books will be dispatched on the publication date of 1st September 2011. Payment is either via Paypal or by cheque, please see the Chequered Flag Publishing website for details.